What the public sees of China’s most important political event—the 19th National Congress—is mostly a show. “Elected” delegates (in fact chosen by Party higher-ups) convene every five years to determine new leaders—when the roster is actually pre-determined through back-door power plays. But if you read between the lines, you’ll see clues to what is really going on. On Oct. 18, the opening day of the congress, current Chinese leader Xi Jinping, who is expected to continue in his position for another five-year term, gave a speech in front of more than 2,000 delegates. With party elders and other VIP officials on stage behind Xi, the occasion is a display of the Chinese Communist Party’s unity behind the man in power. But if you look closely at the CCTV (China Central Television, the state broadcaster) live broadcast of the speech, hidden messages abound, signifying the Party’s infighting. 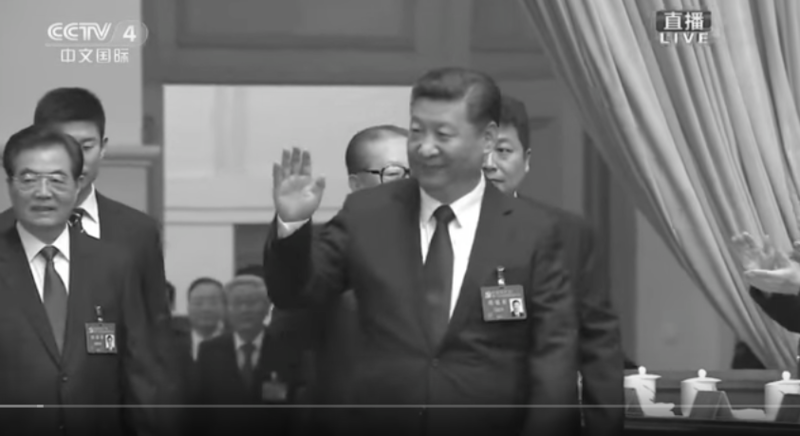 Right when Xi walks into the venue, Beijing’s Great Hall of the People, the camera shows former CCP leaders Jiang Zemin and Hu Jintao, and others trailing behind them. But Jiang’s face is repeatedly obscured by Xi walking in front—in contrast with Hu, who walks out later but can be seen in full view. Xi and Jiang are in a bitter power struggle. Xi has spent the past five years since he took power purging Jiang loyalists who still hold influence in the Party. Through Xi’s campaign to investigate corrupt officials, many Jiang faction officials have been purged. China current affairs analyst Ji Da said it is common for the CCP’s mouthpiece media to convey subtle messages via camera shots. Per party convention, Jiang was invited to the congress as a former leader, but he gets slighted on-screen several times, effectively given the cold shoulder treatment, Ji said. As Xi begins his speech, the camera occasionally pans to Jiang, who can be seen examining a personal notebook—not the copy of Xi’s progress report—using a massive magnifying glass. Off camera, journalists from outside China report that Jiang repeatedly checked his watch, appearing disinterested and dozing off several times. When Xi gets to a section of his speech about fighting corruption, emphasizing a “zero tolerance” approach toward those in the party who engage in bribery, the camera cut to Jiang. Later, when Xi starts a sentence with “what the people and the masses oppose, what they abhor,” the camera once again goes to a close-up of Jiang. The underlying meaning is all too clear for Chinese viewers. When Xi finishes his speech, Jiang gets snubbed one more time. Xi first turns to Hu to shake hands with him. The camera lingers on the scene. 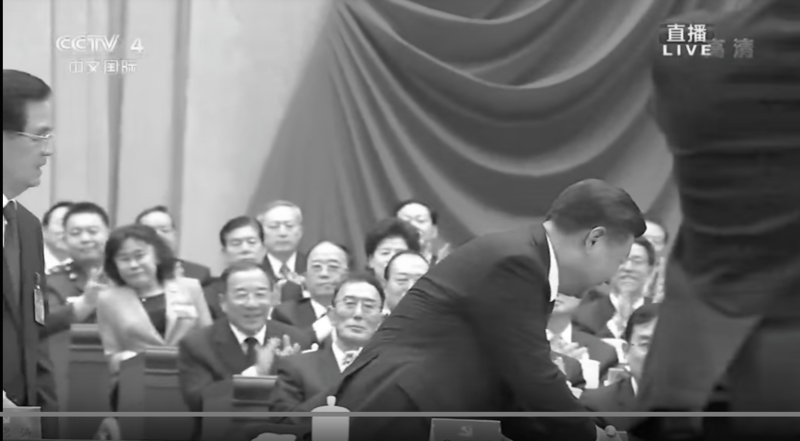 Xi then turns to where Jiang is sitting, but the camera only shows a view of Xi extending his arms toward Jiang’s seat, with Jiang completely obscured by a cameraman on the side. In the next shot, Xi and Hu are chatting and smiling, signaling that they are on the same team. 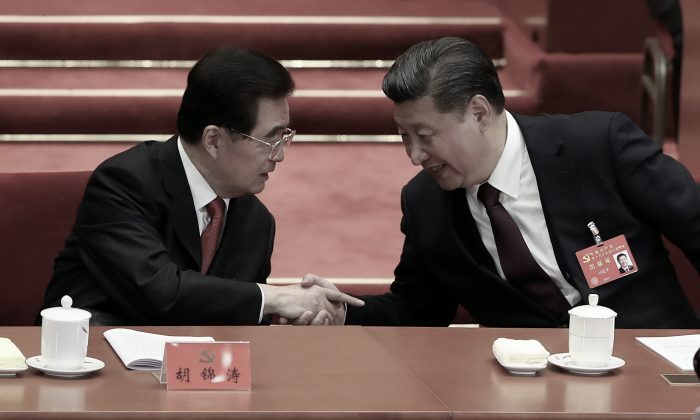 Pointedly, there are no shots of Xi interacting with Jiang. Based on what the silent message appears to be, Xi and Jiang are still at war. Lou Ya and Xu Meng’er contributed to this report.